Nollywood Actress Oluebube Nkechi joins league of Nigerian celebrities to be endorsed as one of Numatville Megacity Ambassadors. 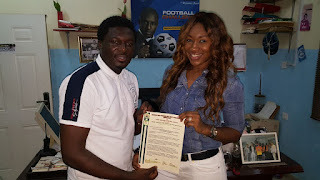 Gets a free complimentary plot at the Nollywood Quarters of the Megacity..
Nkechi Oluebube is the latest celebrity to be endorsed by the Project Manager ( Hon. Jonathan Daniel - Jodela) . The Nigerian Unity Museum & Trade Tourism Village (Numatville) is a celebnty community, 30 mins drive from Mararaba Abuja with the vision to showcase Nigeria's cultural heritage and to become Africa's first and largest national tourism and cultural megacity. The initiative is supported by the Federal Ministry of Lands, Housing and Urban Development, Abuja. Be a part of this National Project. An Initiative of Hon Dr Akin Olowookere. Ex Board Chairman Ondo State Lands, Housing & Property development corporation..